Customize Your Own Film Products! "Sangbo offers HCPS (Hyper Customizing Production System), a unique ODM & OEM service, that accurately delivers customers' values and appeals to their consumers, helping customers to successfully enter the market with unique window film brands by providing professional support of the entire process ranging from brand planning, product development to launch." In the existing window film market, only a few manufacturers and window film brands, equipped with development infrastructure and manufacturing lines, can launch window film brands with a limited lineup through OEM/ODM companies. Weak price competitiveness and product strategy have stifled many customers' growth potential. However, with Sangbo's HCPS ODM Service, window film and PPF brand companies, as well as automotive aftermarket businesses, can utilize the service as their own infrastructure, engaging in product development and production without huge investment in R&D or manufacturing facilities. 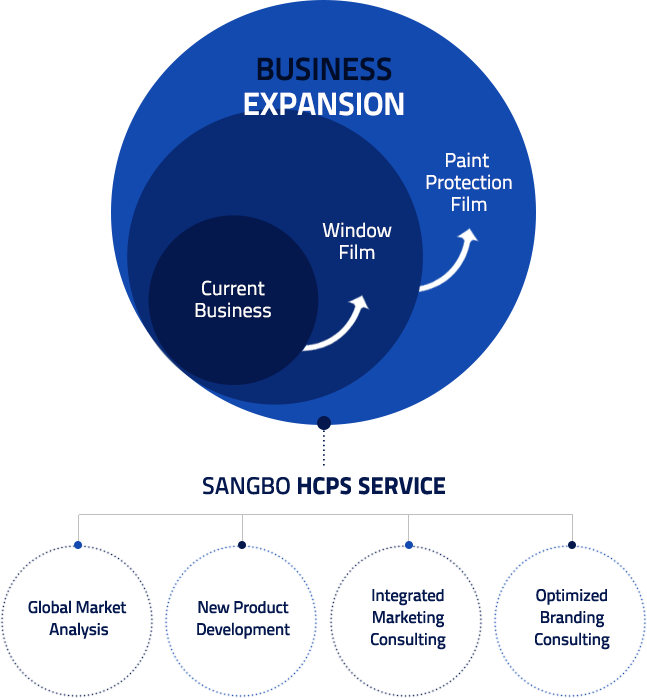 This unique service enables small & medium sized automotive aftermarket businesses and brand companies to extend their business portfolio to high performance window films and paint protection films with both technological and price competitiveness. Sangbo also offers custom designed products through special product development agreements based on long-term business perspectives. Meet this reliable ODM business partner that knows the window film market inside out and has the market experience and expertise to prove it.